Simple to look at, lovely to hold, each item is one of a kind. Naked Clay Ceramics is a collection of handmade minimal style tableware in Porcelain and Black Stoneware that celebrate the beauty and feel of unglazed clay in it’s fired state. Inspired by the natural colours and textures of the earth, everything is made in my studio in Bedfordshire. Liquid clay, made in the studio, is poured into plaster moulds that I make myself. 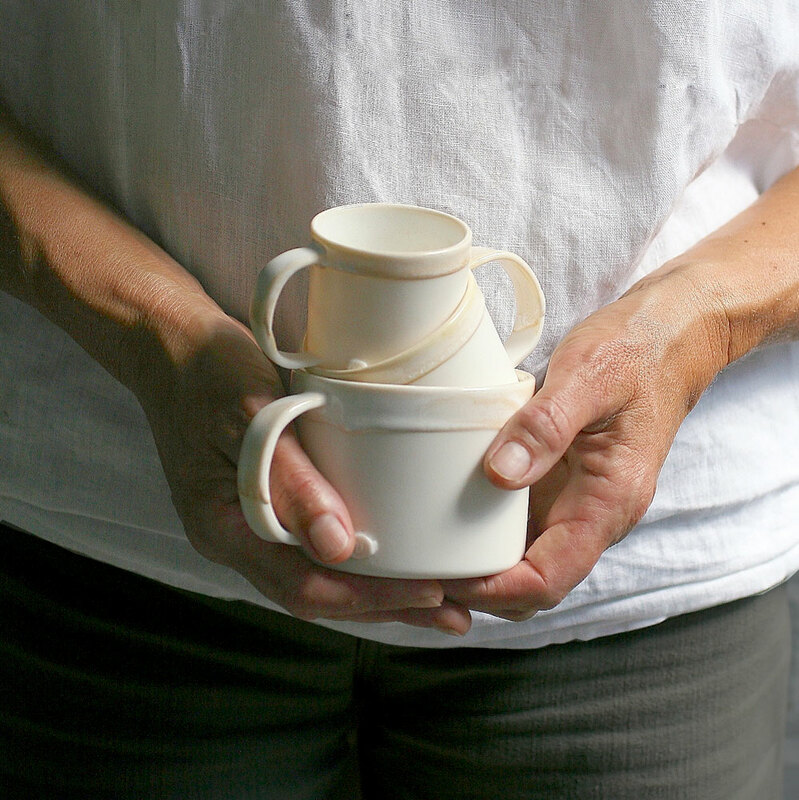 Solid clay is wedged, rolled and formed into plates, bowls and the handles for the mugs. Each piece is sanded smooth before and after the first firing. Although they will be watertight after firing, for practicality and comfort I glaze the insides and rims and add a makers mark on the outside. The pieces are fired and sanded a third time resulting in a matt, velvet finish for the stoneware or a silky shimmer for the porcelain. Everything is high fired in the kiln to a temperature that ensures they are vitrified and nonporous even when unglazed. At these high temperatures there is some natural movement of the clay in the kiln. When they leave the kiln these pieces will not conform to the symmetrical perfection and uniformity found in factory made items, but will each be individual and unique. From my hands to yours, I hope you enjoy the natural feel of fired earth in your hands. To receive early news about new items, events and shop updates sign up to the newsletter here.